Illuminated letters from Pugin. The left to J.R. Bloxam, fellow of Magdalen College, Oxford, Pugin’s principal liaison with the Oxford Movement. The right to J.F. Russell, member of the Cambridge Camden Society. This book is the final volume of the letters of Augustus Welby Pugin (1812–1852), the man most responsible for the nineteenth-century Gothic Revival. He designed Big Ben, the Houses of Parliament, six cathedrals, sixty churches, monasteries, convents, homes for retirees and construction workers, and more, as well as everything inside and out of these structures: gargoyles, doors, floor tiles, candelabras (or Pugin’s term “coronas”), crucifixes, altar linen and vestments, chalices, stained-glass windows, umbrella holders—everything. A self-taught architect, Pugin died at age forty after a working life of only fifteen years. This volume includes his formal letters to editors (e.g., March 9, 1851, to the Tablet and Catholic Standard); 50 letters concerning his March 1851 An Earnest Address on the Establishment of the Hierarchy following the pope’s reestablishment of the hierarchy in 1850 that had resulted in antipapal riots; 25 on his newly published A Treatise on Chancel Screens and Rood Lofts; 225 on the Houses of Parliament with the House of Commons to open in February 1852 (he made over two thousand drawings); and over 100 concerning his stunning marketing success, his “Medieval Court,” filled with examples of his work, at London’s 1851 Great Exhibition, to which came six million people, equivalent to a third of the population of Great Britain. The young (age thirty-two) Queen Victoria visited Pugin’s Medieval Court twice. Margaret Belcher, the editor of all five volumes, died in November 2016 at the age of eighty. She was a retired senior lecturer in English at the University of Canterbury, Christchurch, New Zealand. She authored a highly regarded chapter entitled “Pugin Writings” for the book published in conjunction with the 1994 Pugin exhibition at the Victoria & Albert Museum. She devoted six of her eleven pages to explaining why Pugin’s first book, Contrasts, self-published in 1836 at age twenty-four, was more than a work of architectural history or criticism, but a work of literature. And she devoted three pages to the Earnest Address. In 1987, Dr. Belcher published A.W.N. Pugin: An Annotated Critical Bibliography. That same year, she started working on Pugin’s letters. She collected, from a large array of sources, all the letters Pugin had written. She also collected all the letters she could find written to Pugin. 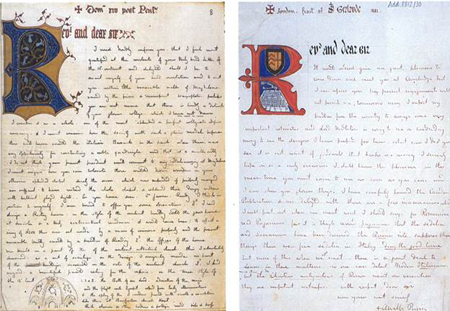 Pugin had routinely destroyed letters he received, but he forwarded some to other people who saved them. In her introduction to the first volume, which appeared in 2001, Dr. Belcher included “Editorial Procedure,” which is not repeated in subsequent volumes. She informed her readers that she would not change the spelling, punctuation, or capitalization of Pugin’s letters lest this interrupt the reader’s attention. She also described her conventions for italicizing or boldfacing the text. If Pugin included a sketch in a letter, she indicates such. If a word is illegible, she indicates this too. Dr. Belcher gives her opinions on the identity of unidentified recipients and on the dates of undated letters. Her detective work was so thorough that there are only twelve pages of letters she despaired of dating; she placed them in this final volume. Also in this final volume are eighty-four pages of letters that she obtained after the first four volumes were printed. And there is one page of errata for the previous four volumes. There are over three thousand pages in the five volumes, plus introductions, indices, and black-and-white figures and plates. Moreover, they are squeezed in by using 9-point type for regular text and 7-point type for notes and the letters to Pugin. All the notes for a letter follow that letter. The notes cross-reference Pugin’s cryptic diary entries. They include explanations of phrases like “to have the weather gauge” and “I throw the Hatchet.” For every correspondent or person mentioned in the letters, the editor provided full name, age, role, relationship with Pugin, occupation, and place of residence. Pugin wrote some letters in French, but they are not translated. Dr. Belcher succeeded immensely in exhaustive, painstaking work. James M. Thunder is an environmental lawyer who reviewed two books about his ancestor, A.W. Pugin, for SACRED ARCHITECTURE (Summer 1999). He is writing a book on Faith-Based Land Use Planning and welcomes comments.